It's easy to shoot videos on your Android phone, but getting them looking amazing is much trickier. That's why you need a free video editing software app. With one of these handy apps on your phone, you can tweak your clips to perfection before uploading them to Facebook, Instagram, Twitter or YouTube. Apps for editing your videos are so convenient, it's no surprise that the Google Play Store is packed with them. That's why we've picked out the very best ones, and put them through their paces so you can pick the one that suits the way you shoot. All of these editor apps are free to download, and we've noted those that include in-app purchases. FilmoraGo for Android is as powerful as many desktop programs, and works in much the same way. Start by selecting video clips and photos from your device, Facebook or Google, then add them to your pool of resources. The number of media files in your pool will be shown in a tab on the left. Tap ‘Next’ to access the main screen. You’ll see previews of all your images and video clips along the bottom of the screen. Although not labelled as such, this is a timeline, and you can drag each file to rearrange them. There are ready-made themes to give your video a new look. You can try them out with a single tap, and they're fun if you’re planning to upload your creation to Facebook. If you have multiple video clips or images, you can apply fun transitions to switch between them, and although no way to split video clips into sections, you can crop the video, change the aspect ratio and add subtitles. You’ll also find all the usual color optimization options (brightness, contrast, saturation etc), plus speed adjustment. One of FilmoraGo's most impressive features is picture-in-picture, which lets you insert a second video or still photo, adjust its size and position it wherever you like over the first one. You can even decide when it appears and apply a transition, so it spins, slides or fades into place. Your video won’t be watermarked when it’s exported, but FilmoraGo will add a brief wordmark at the end. Once it’s processed, the finished video can be sent straight to any social media app you have installed, shared via email, or saved to your device. FilmoraGo is a remarkable app for Android, packed with more features than many desktop tools. There are no ads, and although FilmoraGo offers in-app purchases for additional filters and effects, the store isn’t obtrusive. Highly recommended. Before you can use Adobe Premiere Clip, you'll need to sign up for an Adobe ID if you don’t already have one. It takes a moment, but once it’s done you can use the same login details for all Adobe apps and desktop programs. There’s a social element that lets you watch other users’ videos, or you can dive straight into making your own. When you open a video, there are two options: Automatic and Freeform. Automatic overlays a piece of music, and makes cuts to your video to match the chord changes. This works fine for longer videos that don’t rely on narration, but for shorter pieces or those requiring greater control, you’ll need to use Freeform. Here you can create a timeline from several video clips and images, trim them size, adjust the speed, select a new soundtrack, and apply filters. The focus here is on smart, professional looking videos rather than fun or silly clips to share with your family on Facebook, so there are no stickers or cheesy animations available. Instead you get a selection of tasteful fade and motion options. Your finished video won’t be watermarked unless you decide to make your own (you’ll find the tool in the Preferences menu), and when you’re done you can save it to your device, share it on Creative Cloud (if you have an account), publish it, or post it on YouTube or Twitter. It’s a shame there aren’t more social media options, but since this tool is aimed at the more serious end of the spectrum. It makes sense. Adobe Premiere Clip's interface only works in portrait mode unless you’re watching a video, but the layout makes better use of the available space than many other apps available for Android. 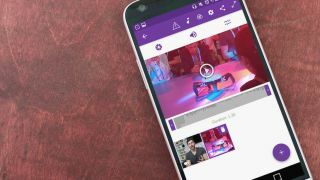 VivaVideo lets you edit existing videos or capture clips directly within the app. The workflow is much like FilmoraGo’s – open (or record) a clip, then trim it and add it to a timeline. Like Adobe Premiere Clip, VivaVideo only works in portrait mode – not our preferred choice for videos – and its interface doesn't make such good use of the space. That said, it's easy to navigate, and every tool is clearly labelled. There are various themes to choose from (a wider selection than you'll find in FilmoraGo), and even more are available as in-app purchases. We’re particularly fond of the Parkour filter, which adds dramatic spins, wipes and random zooms to your clips, and is great fun for spicing up dull footage in an ironic sort of way. The FX options and animated stickers are also fun, and although there are no manual controls for contrast, saturation and brightness, there are lots of presets – many of which are designed to flatter portraits. Videos are watermarked with the app’s name, though this is fairly discreet, and there’s a five-minute limit on exported clips. You can lift these limitations by purchasing a subscription for £1.79 (about US$2.50, AU$3) per month or £9.49 (about US$12, AU$15) per year. That might not sound like much, but when superb apps like Adobe Premier Clip and Wondershare Filmora Go are available free, it’s significant. KineMaster offers two options: Empty Project and Project Assistant. Using the Project Assistant, begin by selecting all the video clips and photos you want to include, then choose whether you want to use a theme (the standard options are On Stage, Travel and Serene). Next, add any text you’d like to appear during the video (titles or captions) and finish your project by adding some audio. There are a few samples included with the app, with many more available as in-app purchases. You can also use MP3 files from your device. You might be happy with the results as they are, but if not you can add further effects and media using KineMaster’s advanced options. These are presented in an attractive and intuitive wheel menu, and include the ability to add more media, record a voiceover, apply new special effects and insert more text. You can also record new video by tapping the red button in the center of the control wheel. Delving into the project settings lets you choose how long photos are displayed, apply audio and video fades, and adjust crop and pan options. When you’re done, add the video to your projects and you’ll be able to watch it, save it to your device or Dropbox, or share it via your preferred social media app. KineMaster will add a small watermark to the top right of your video. You can remove this, and unlock all the premium music and other assets by upgrading to the pro version for £2.91 (about US$4, AU$5) per month, or £23.25 (about US$30, AU$40) per year. It’s quite a steep price for a mobile app, so we recommend trying the other options here so you can decide whether it’s one you’re willing to pay. When you fire up Movier Maker Filmmaker YouTube & Instagram, you’ll be prompted to create a new ALIVE account, or log in with Facebook. As with Adobe Premiere Clip, this is so you can use the app’s social video-sharing element, which lets you create a custom profile and follow other users – much like Instagram. To start making a new video (called a Video Story in the app), tap the plus icon and select the clips and still photos you want to include. The app will scan your document folders for you, so there’s no need to spend time tracking down your media files. The tool itself runs in portrait mode, and targets the fun/silly end of the market with stickers and explosion effects. Your video will be exported in a square format, making it a good choice for Instagram (as the app’s name suggests), but not for Facebook or other sites. There are no advanced tools for manual color adjustment, but as with KineMaster, you get a generous selection of filters. There’s a good selection of background music to experiment with (the Determined option will turn a video of your pet frolicking in the garden into a dramatic movie trailer), or you can add a song from your device. When you’re done, add a description and some hashtags (#FeatureMe and #VLOG are included automatically) and either sit through a couple of ads, or dismiss them. The video will be processed and added to your ALIVE account, where you can download it or share it to your preferred social network. Movie Maker Filmmaker YouTube & Instagram is a stylish app for Android, but we’re not too keen on the default square output format and the ads are a little intrusive.